Older red sea-leaf specimens, with somewhat tattered blades and exhibiting some branching. Image courtesy of Sandra Lindstrom. Collection number SCL 15347 in the UBC Herbarium Algae Database; search the specimen in the database for more information, or search the species for more occurrences. 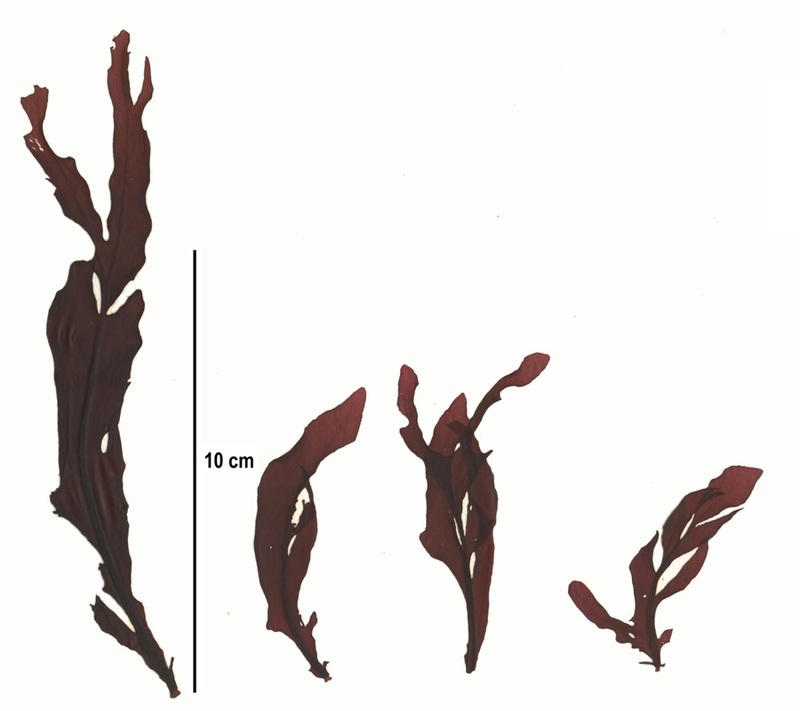 This red alga has dark red to purple annual blades to 50 cm long and 8 cm wide. These blades have conspicuous midribs and veins. Multiple blades may grow from a single disc-shaped holdfast. Young blades are pointed, whole, and undivided; older blades become tattered and may divide into two or three branches. Later on in the growing season small papillae grow on the blades. Red sea-leaf grows on rock in the low intertidal and shallow subtidal. It can be found along exposed outer coastlines. Its range extends from central Alaska to southern California. O'Clair, R. and Lindstrom, S. Erythrophyllum delesserioides J. Agardh . In Klinkenberg, Brian. (Ed.). E-Flora BC: Electronic Atlas of the Plants of British Columbia. Lab for Advanced Spatial Analysis, Department of Geography, University of British Columbia, Vancouver. Accessed 20/04/2015.